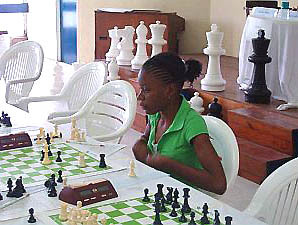 Deborah Richards is the lone female star on Jamaica's chess circuit. In the last couple of years, she has established herself in the "men's" realm. She is the first to earn Jamaican women's master title, but it goes without saying that she is shooting for higher goals. In the Jamaica tournament scene, she has "graduated" from the age and gender tournaments and is battling with the strongest players on the island. It now comes as no surprise when she scores an impressive win over one of the local masters. In the featured game, she faces a Jamaican legend, 7-time national champion… Shane "The Magician" Matthews. Richards plays her standard English and is forced to stare down the kingside attack of a Dutch. Exciting see-saw battle!